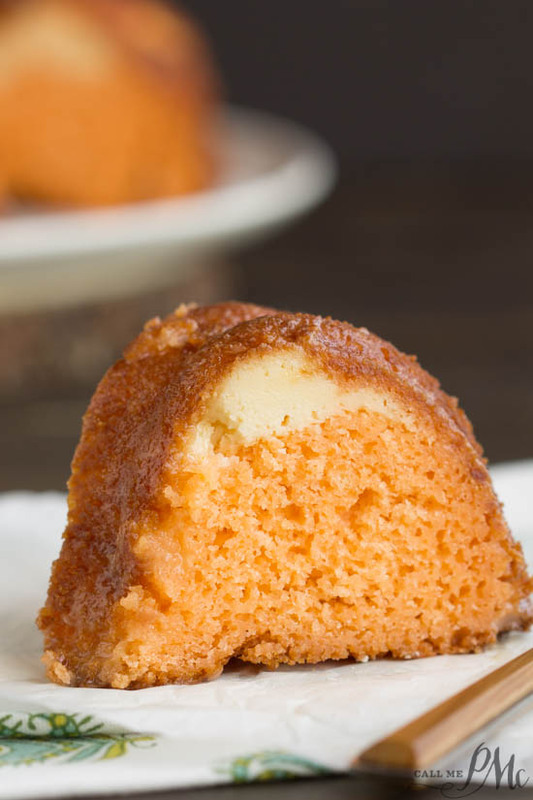 Orange Bundt Cake is tender with a wonderful citrus flavor. 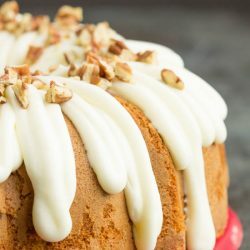 It has a ribbon of orange zest filled sweetened cream cheese running through it making it a moist and delicious recipe. The benefit of using cake mixes as a base for cake is it takes me slightly less time when I use a cake mix and using a cake mix gives me very consistent results every time. 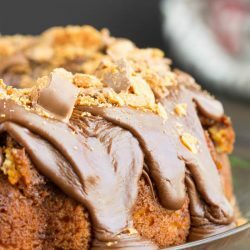 You may also like these cake mix cakes. This cake starts with a mix. 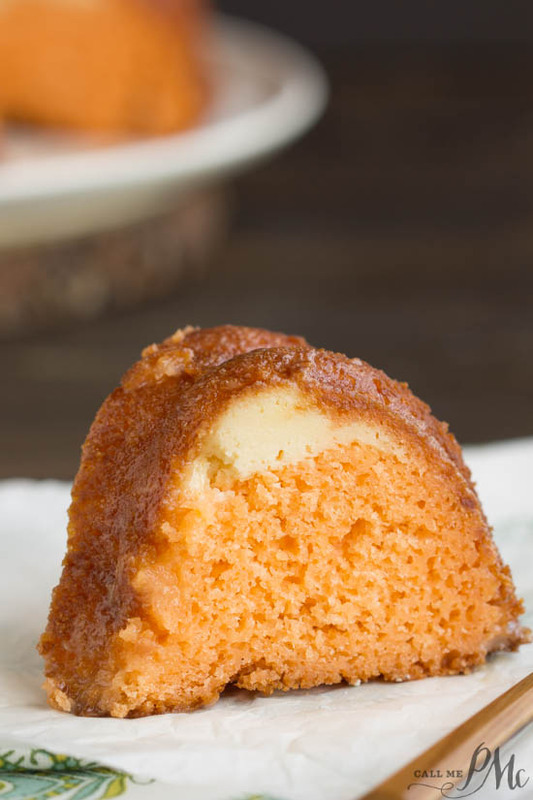 Additionally, Orange Bundt Cake is full of orange flavor from orange gelatin, orange juice, and orange zest. 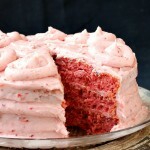 The ‘frosting’ is in the center of this cake in the form of a cream cheese ribbon running throughout the cake. The cream cheese is spiked with orange juice, orange zest, and just enough sugar to slightly sweeten it. 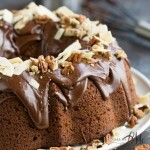 The most important tip I can offer for making this cake is to liberally grease the bundt pan. As well, you’ll need to wait 45 to 50 minutes for the cake to cool before inverting it onto a serving tray. The cream cheese needs to be cool before inverting the cake or it will stick and/or the cake will come apart at the cream cheese layer. 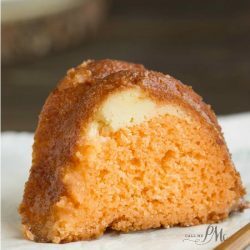 I use this Classic Nonstick 9-1/2-Inch bundt pan for this Orange Bundt Cake. I created a video tutorial to show you my method for making this cake. Take a quick look, it’s not very long. Grease a 9 and 1/2 inch or 10 inch bundt pan liberally with solid vegetable shortening. Add butter to the bowl of an electric mixer and mix until creamy. Add eggs, cake mix, gelatin, and orange juice to butter and mix 2 to 3 minutes until everything is combined and smooth. Spread approximately 3/4 of the cake batter in the prepared bundt pan. 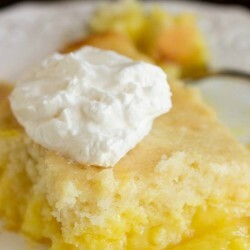 Combine cream cheese, sugar, orange zest, orange juice, and 1/4 cup cake mix to a small bowl. Cream until mixture is smooth. Add mixture to a ziptop bag and snip the end off. Add the filling on top of the first layer of cake batter. Cool cake for 45 minutes before inverting on a serving platter. Add confectioners sugar and orange juice to a bowl. My husband loved this cake!! He doesn’t eat cake but he couldn’t stop eating this one. I loved it as well. This is my favorite cake!! I have never made an orange cake, but have always wanted to. Your recipe sounds really good so I am going to try it. You have wonderful recipes,thank you for sharing. Fabulous cake. The recipe has not been corrected though to add the Jello. 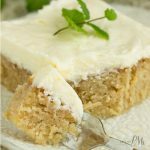 The recipe has not been corrected to add confectioners sugar or orange jello. Is the latter added to the cake mixture and the conf. Sugar added to the cream cheese filling? I’m looking at the recipe and it’s correct. I noticed that your recipe states that 1/4 cup of butter is used. However it appeared to be a whole, 1/2 cup stick in the video. Maybe the butter I buy comes in fatter sticks than yours??? Good morning. Your recipe is missing the jello.. I read the post and then read the recipe… no jello.. then looked at the video.. Otherwise, all looks yummy. Thank you, sometimes I look at a post so many times and keep missing the same thing. I corrected it. believe me, I have done that with letters etc… Have a good day.. WE have sunshine over here in Australia… so pleased, as have had so much rain.. Maybe a good day for the Orange bundt cake.. Yes, I had accidently left the jello out of the recipe here. I have corrected it now. So sorry about that. I proofed it several times and didn’t catch that.